NEW YORK, Sept. 25 (Yonhap) -- North Korean leader Kim Jong-un is a young but trustworthy leader who will honor his promise to completely denuclearize his country, South Korean President Moon Jae-in said Tuesday. In an interview with U.S. news network Fox, the South Korean president also expressed his conviction that the communist state will give up its nuclear weapons because its denuclearization pledge comes from its highest leader. "I believe there are many people who do not believe North Korea will keep its promise because there have been many denuclearization agreements that failed, and therefore many people remain skeptical," Moon said, according to a full script of the interview released by his office Cheong Wa Dae. "However, the latest denuclearization agreement is completely different from those of the past," the president added, insisting the past agreement may have failed because they were reached at working-level negotiations, such as six-party talks. "But the latest denuclearization agreement was reached by the U.S. president and North Korea's highest leader in a direct summit for the first time in history, and was promised to the entire world. I believe the binding power (of such an agreement) is different." Kim agreed to completely denuclearize his country in his historic summit with U.S. President Donald Trump, held in Singapore on June 12. Moon's visit here followed his three-day trip to North Korea last week for his third bilateral summit with leader Kim. "Chairman Kim Jong-un is a young but very honest and frank person, and I am convinced he has a firm determination to denuclearize," the president said when asked about his impression of the North Korean leader. "In addition, I believe Chairman Kim Jung-un has a strategic mind to give up nukes and instead focus on making the people of North Korea live better off through an economic development," he added. Moon earlier said the North Korean leader expressed his willingness to completely denuclearize his country before Trump's four-year term ends in January 2021. To this end, a second U.S-North Korea summit may be necessary, as well as a declaration of end to the Korean War, the South Korean president said. 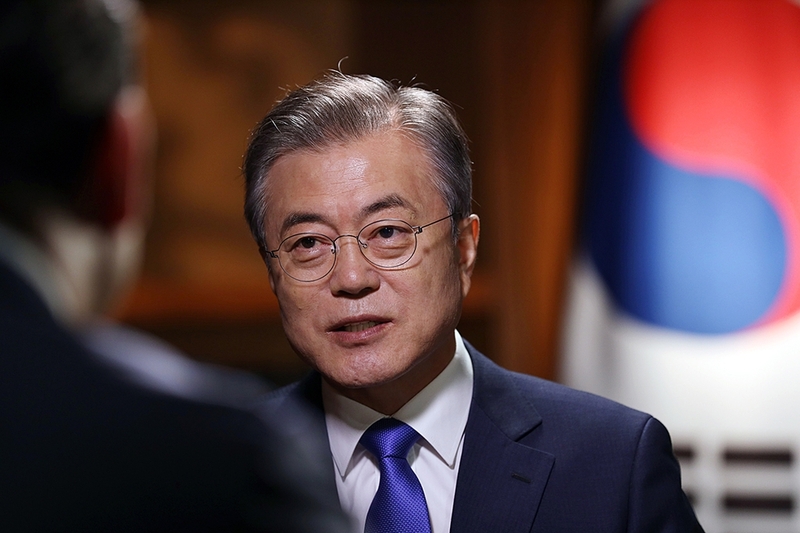 Moon noted many feared a declaration of the end to the war may weaken the South Korea-U.S. alliance, which in turn could force the U.S. to withdraw its troops stationed in South Korea. 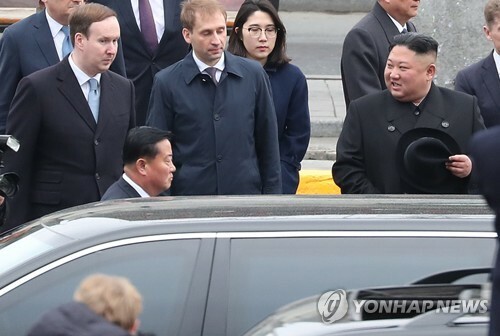 He dismissed such concerns, saying a declaration would only be a political or symbolic gesture aimed at providing some security assurances to the North, which agreed to give up its nuclear weapons in exchange for security guarantees from the U.S.
"Not only that, but (the fate of) U.S. Forces in Korea will be entirely decided by the South Korea-U.S. alliance even if a peace treaty is signed, and it also has nothing to do with a peace treaty," Moon said, adding he is personally against the withdrawal of U.S. troops in South Korea even after a peace treaty is signed with the North. The South Korean president said he and Trump also discussed the possibility of formally ending the 1950-53 war when they met here the day before. The two Koreas technically remain at war as the Korean War ended only with an armistice. Also, the president said a declaration of war's end could be reversed at any time if necessary while the denuclearization steps taken or will be taken by North Korea cannot. "One thing clear is that South Korea and the United States now have nothing to lose in denuclearization negotiations even if the North Korean side stays as it is. The steps North Korea has to take is to dismantle its nuclear test site, dismantle its missile test site, dismantle its Yongbyon nuclear facilities, dismantle other facilities and dismantle nuclear weapons that have already been made. In other words, it needs to take irreversible steps," Moon said. "But the step the United States and South Korea are taking in response is to suspend their military exercises, which can be resumed at any time. A declaration of end of war can be called off at any time because it is a political declaration. Even if we ease sanctions (against North Korea), we can simply strengthen our sanctions again if North Korea cheats or breaks its promise," he added.